I was waiting for the light to change at the corner of Geist and University, when I looked over at the brand new Subaru Forester next to me and noticed a magnificent spiderweb array of windshield cracks. It was so Fibonacci. so spiral nebula, so double helixissimo that I grabbed my cobalt blue Cannon Powershot Elph from my purse and was about to click to infinity, when I noticed the woman in the passenger seat frowning at me. I grinned, waved, put my camera away and prayed to God that she wasn’t packing a shot gun. Many are around here, judging by the bullet holes in virtually every road sign. Okay, so I didn’t get shot, or get the shot. The photo above is from my trusty old friend, Wikimedia Commons, though it is quite similar to the one I would have taken. But I did learn something. 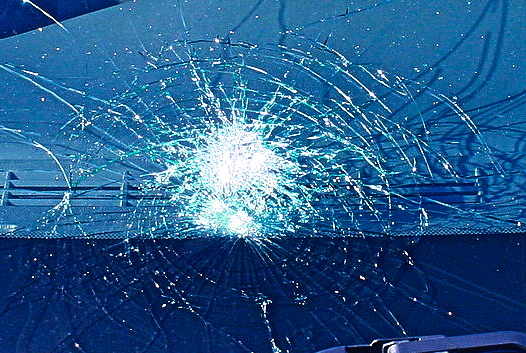 A cracked windshield has character and, in this case, it had the esthetic luminosity of an ancient, cracked Japanese vase. I began to look around for other artsy windshields, and the best place to do that in Fairbanks is in the parking lot of the only-game-in town-one-stop-shopping-mecca, Fred Meyer. I parked and walked around with my Cannon. Here’s the first crack I spotted. Was I excited? Not so much. A single snake of a crack? Who needs it? I kept up the search, meandering between SUVs so large they would have been considered houses in some parts of the world and battered and rusted-out trucks that might have been dumped where I come from. 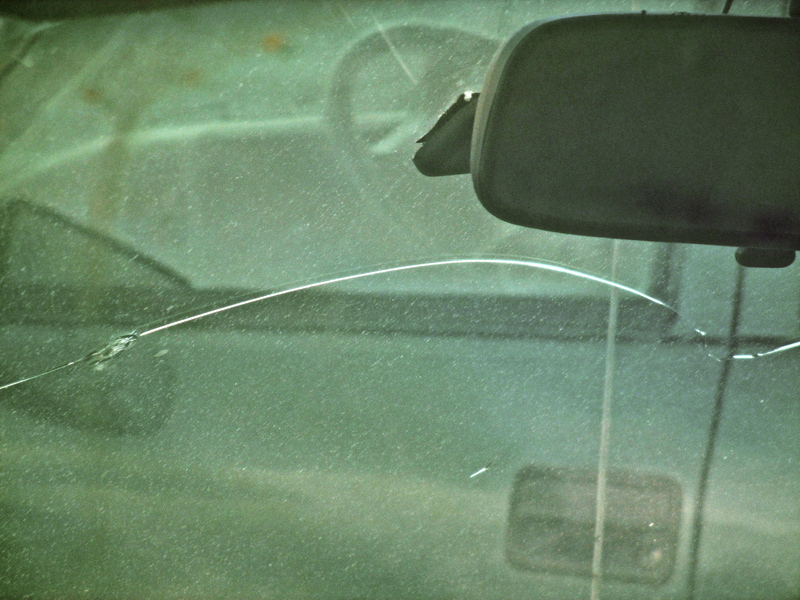 But the same knife slash of a crack seemed to be the norm, and most of the cars in the lot had one. After a while, I knew that I’d seen the ultimate crack in Fairbanks, and possibly the world. It was time to either head to Iceland or go home. By the way, Peter Mulvey, with whom my son, M, had the good fortune to study guitar when Peter was in Boston, has a written a touching song about Fairbanks and its windshields that have seen better days. Here it is for you to enjoy. I drove back to my daughter’s house out on the marina and looked around at the airplanes parked everywhere along the dirt road that serves both cars and small aircraft in the neighborhood. There are signs posted everywhere that encourage cars and pedestrians to give airplanes the right of way. No problem there. Just to compare, I tried to locate even one cracked plane windshield among the hundreds before me, but there were none. Not even one! 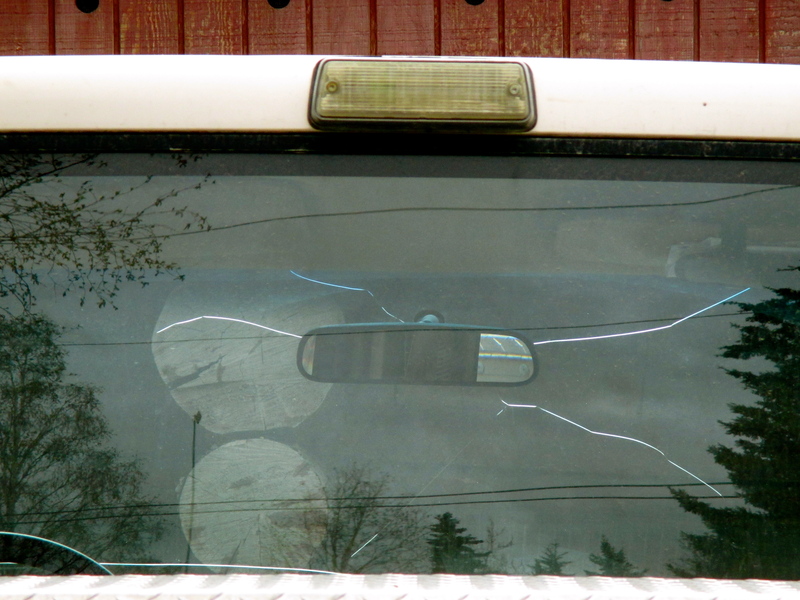 Maybe the strict Alaskan windshield rule stating that a windshield must be replaced if it does not afford a driver clear vision even if the crack is tiny, is actually reinforced with airborne vehicles, unlike with cars. Which is why at the end of the long driveway that leads to my daughter and son-in-law’s hangar and house, I wasn’t surprised to find their old Suzuki parked out front with a triple lightening-bolt crack jutting out from the center of the rear view mirror like a wabi sabi butterfly, a sort of low-end gallery on wheels. And kind of nice. That was very interesting–like how you took one observation and used it to look at the town’s culture—solid piece of narrative journalism. Thanks, jd. There is a bit of Mexico here in the sense of magic and it calls to me…kind of a tequila on the rocks. Both are hearty cultures where people use humor and ingenuity to survive. Love the wabi sabi reference and the Fairbanks flair for windshield blooms and butterflies! Well done. Thank you, Victoria. I’m certainly in awe of the unique cultural microcosm here. It makes the subdued excitement of B’ham look like New York City! Enjoyed the music as I read about windshield cracks. What a great subject — and also true of Southern Oregon. Dirt roads. Yep, I remember some of those S.O. roads. Miss them and the rest of my heart’s state sometimes. Glad that you liked the music, too, Katie. It was a great find. Yep, I remember some of those S.O. roads. Miss them and the rest of my heart’s State sometimes. Glad that you liked the music, too, Katie. It was a pretty good find.